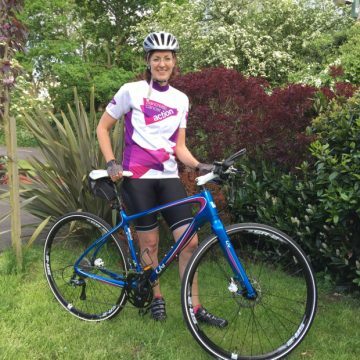 Suzanne Roe from Coleshill, is cycling 54 miles in the London to Brighton Cycle Ride on Sunday 11th September to raise funds and awareness for the UKs fifth biggest cancer killer, pancreatic cancer. Suzanne is determined to raise funds for small charity Pancreatic Cancer Action in memory of her mother, Joanna Roe, who passed away from the disease in 2009 aged 72. Suzanne also feared she too had pancreatic cancer after being diagnosed with a rare pancreatic tumour (IPMN) in January 2015. Thankfully due to surgery at the specialist HPB unit at Queen Elizabeth Hospital Birmingham, the tumour was successfully removed, and found to be non-malignant. However, the surgery has had a huge impact upon Suzanne’s day-to-day life as removing half her pancreas and her spleen has meant daily medication to help her body cope with infection. Suzanne says: “Until May this year I hadn’t even been on a road bike but after borrowing my husband’s bike I was hooked. Pancreatic cancer has the lowest survival rate of all common cancers- it has stayed at just 4% for almost 50 years and 26 people die a day from the disease. Pancreatic Cancer Action is committed to working towards earlier diagnosis of the disease so that surgery, currently the only cure, is made available to the sufferer. Ultimately this will lead to improving survival rates. Ali Stunt, Founder of Pancreatic Cancer Action, said: “We are delighted that Suzanne is giving her time to support Pancreatic Cancer Action. Previous Article Bromsgrove widow is taking on the Great Wall of China Next Article I have Type 3c Diabetes - what is that all about?